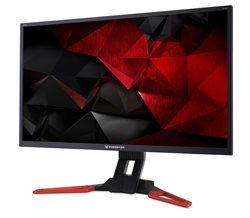 Acer America, an industry leader and innovator in gaming hardware, today announced that it’s rounding out its Predator gaming line-up in the United States with the addition of the Predator XB321HK monitor. The Acer Predator XB321HK's IPS panel delivers a quick 4ms response for rendering fast moving actions.. This new display offers spectacular visuals with 4K UHD resolution and high 100 percent sRGB color accuracy and reproduction. This new display offers a 32-inch panel boasting spectacular visuals with 4K UHD resolution (3840x2160@60Hz using DisplayPort and 3840x2160@24Hz using HDMI) and high 100 percent sRGB color accuracy and reproduction. Featuring NVIDIA® G-Sync™ technology, it decreases screen tearing and minimizes display stutter and input lag to deliver incredibly realistic game play. The Acer Predator XB321HK’s IPS panel delivers a quick 4ms response rendering fast-moving actions and dramatic transitions without smearing or ghosting. It also provides wide viewing angles with accurate colors up to 178 degrees horizontally and vertically, so no targets are missed. Featuring GameView, the new Predator XB321HK lets gamers quickly and easily toggle between three customizable profiles to tweak settings in-game without the need to navigate an OSD menu, a significant benefit when every second counts. Other settings include the ability to adjust black levels to ensure every threat is seen, aim-point assistance to get a lead on opponents and perfect the shot, and the ability to select the on-screen refresh rate. Acer EyeProtect leveraging flicker-less, blue-light filter, ComfyView and low-dimming technologies prevents glare and allows the user to reduce blue light emissions, which may help decrease eye fatigue during long gaming matches. VESA wall mountable, the Predator XB321HK maximizes desk space and the stand can be adjusted up to 4.7 inches and tilted from -5 to 25 degrees for more comfortable viewing. Powerful connectivity is enabled via HDMI, DisplayPort v1.2 and a USB 3.0 hub (1 up/4 down), while two 2W stereo speakers are enhanced with DTS Sound™. The Predator XB321HK monitor is available at leading online retailers. The manufacturer’s suggested retail price (MSRP) is $1,299. The monitors are backed by professional, high-quality technical support and a standard three-year parts and labor warranty. (1) Acer’s online community at community.acer.com provides customers discussion forums, answers to frequently asked questions and the opportunity to share ideas for new and enhanced services and products. Established in 1976, Acer is a hardware + software + services company dedicated to the research, design, marketing, sale, and support of innovative products that enhance people's lives. Acer's product offerings include PCs, displays, projectors, servers, tablets, smartphones, and wearables. The company is also developing cloud solutions to bring together the Internet of Things. Acer employs 7,000 people and ranks No. 4 for total PCs globally. (2) Revenues for 2014 reached US$10.39 billion. Please visit http://www.acer.com for more information. © 2016 Acer America Corp. All rights reserved. Acer and the Acer logo are registered trademarks of Acer Inc. Other trademarks, registered trademarks, and/or service marks, indicated or otherwise, are the property of their respective owners. 1.) Limited warranty agreement applies. For a copy, write to Acer Customer Service, P.S. Box 6137, Temple, TX 76503.